The iPhone Lite aka the affordable iPhone is leaking out in its colorful plastic shells all over the web all day every day, and today is no exception as more fresh images of the green iPhone Lite pictured alongside the iPhone 5. 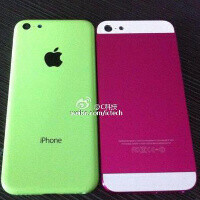 We only get to see the back of the green iPhone Lite and in one of the images a white version appears as well. The device however does not seem to be turned on and could easily be just a mockup, based on the first drawings that leaked out weeks ago. With so many leaks of the iPhone Lite one would think that where there is smoke there is fire. However, we would not rush into quick conclusions about the real existence of the iPhone Lite. For once, we have not seen it fully assembled and turned on, and that’s a red flag. Should you trust what you see now then? We advise some extra caution and the curiosity of a smartphone detective. Did you mean along side the 5s? I don't recall a pink iphone 5. I'm not sure about the dual led. There are aftermarket options for customizing your iPhone. You send it to the company and they'll add a new back plate, different colored glass on the two glass strips... Etc. It looks like a soap with a logo embedded on it . . . and by the way, "Affordable"
iSoap is the only thing I would buy from Apple, perfect for washing my arse. Tweren't so long ago it was all you had times for. Fair weather fanboy. 4.5" iPhone Plus of course. Looks like an HTC first with an apple logo. They should focus more on copying the things that make Samsung the number one smartphone manufacturer, instead. Like they did when copying most of Androids key features for iOS 7. Every single iPhone has other stuff written below 'iPhone' on the back of the phone. The iPhone Lite picture above doesn't. Increasing likelihood of being fake. Wasn't it already proven, that all the images of the cheap iPhone are fake? This cant be i phone lite or mini.Because in every apple product on the back under the logo at the bottom, where tis assembled and CE something like that is written. But this one dont have this. It is FAKE.